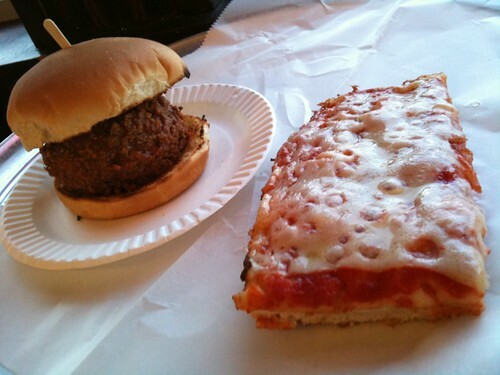 Victory Pig Pizza Wyoming, PA – Only Open Wed, Fri, Sat! 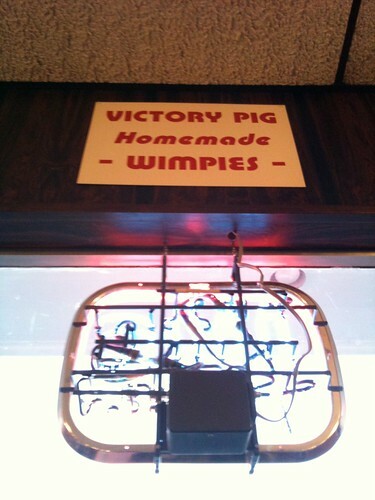 Not sure why it’s called Victory Pig, but that name and the fun vintage sign shown below was enough to make me swing the Retro Roadmapmobile into the parking lot of this classic roadside restaurant in Wyoming, PA (between Scranton and Wilks-Barre PA). And I am pleased to report I got a winner of a slice of NEPA* or Old Forge style pizza here! The Victory Pig Barbecue and Pizza has been open since 1942 and still provides curb service, as the signs on either side of the stucco building indicate. 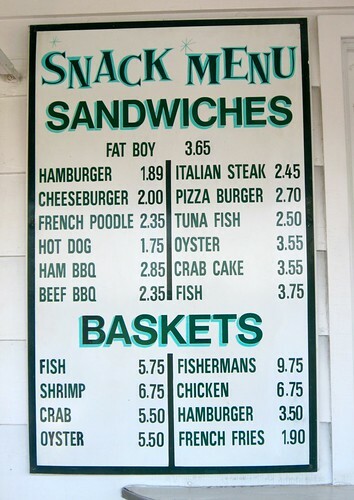 Not knowing what was on the menu I opted to head into the restaurant. As soon as I walked in I was pleased to see a retro looking decor with brown paneling and orange accents, definitely original. And I didn’t take a picture of the interior because it was so full of families, couples and solitary diners that you’d see more people than vintage details. Overhearing the lovely older ladies at the table next to me reminiscing about checking their packages at the Rainbow Room (after a day of shopping in New York City, back in the day) confirmed my decision to stop here for a bite was the right thing. I later found out that a Wimpie is like a sloppy joe, and while it isn’t my absolute fave flavor of sandwich, I was proud of myself for being culinarily adventurous! I did not have any of the barbecue, but from what I read it also is a local interpretation of the dish. You can see my wimpie right next to my “cut” of “pig pizza” and boy was that pizza tasty! The crust is somewhat crispy from being fried in the tray, the sauce was tangy and sweet with bits of onion in it, and the cheese was just the right amount and flavor to harmonize with this local trio of flavors. Now I’ve heard some people compare this local interpretation of pizza to the frozen Ellio’s version but that does not hold a candle to this distinctive pizza flavor and texture that had me longing for another slice while on my drive home. And I am pleased to report that the ratio of cheese to crust does not allow too much cheese to stick to your teeth as some folks have complained about Old Forge style pizza doing. 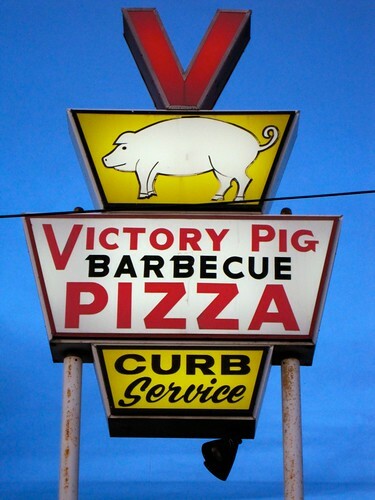 Doing a bit of internet research I find out that the Victory Pig is family owned and operated and they are very proud of their secret pizza recipe and crust. 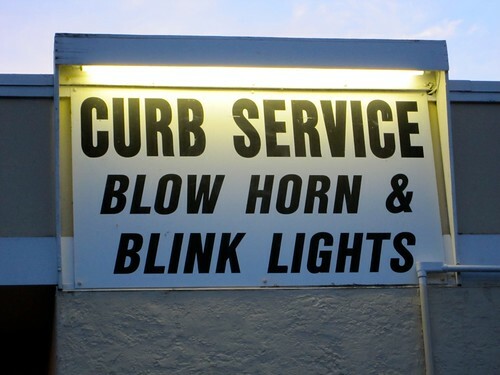 They’re also only open on Wednesday, Friday and Saturday…because they can be! While part of me bums out thinking I won’t be able to indulge in Victory Pig pizza when Retro Roadhusband and I scramble up to Scranton on Sunday November 14, I think it’s kinda cool that someone in this day and age can make such odd business hours work for them. And from the hustle and bustle of that Saturday evening, you can tell that local folks make the effort to get there when they’re open! If you’re feeling a bit full from the food (or beer and cocktails that are surprisingly available in this casual fast-food atmosphere) perhaps you’ll want to check out Rich’s Golf and Fun Center, located just behind “The Pig”. Or maybe you’ve just saved room for some soft serve ice cream? I will warn you that it isn’t nearly as retro and picturesque as its sign, but it could be a fun way to shed some of the calories that you’ll consume once you taste this delicious pizza! Blue Comet Bar and Grill Glenside PA – A Rockabilly Reopen! I’m happy to report that one of my fave bars, the Blue Comet in Glenside PA is open once again! This great neighborhood bar, famous for their live rockabilly music on Sunday nights, was closed for almost 2 years and Retro Roadhusband and I were delighted to see that they were open (since June) as we drove past this afternoon. We took a quick peek in and I’m pleased to report that the place looks the same, if not better than ever, down to the “Talk To The Person Next To You” sign I LOVE, pasted across the screen of the TV. If you didn’t know that this bar had been opened within the past 20 years you’d swear it was a holdover from another era, with its vintage style interior, classic standards and rockabilly playing in the background and blue neon Cocktails sign. With a fresh coat of paint, outdoor patio ’round back, good food and live music, we raise a toast to the Blue Comet – Welcome back! Become a fan of The Blue Comet on Facebook if you like! 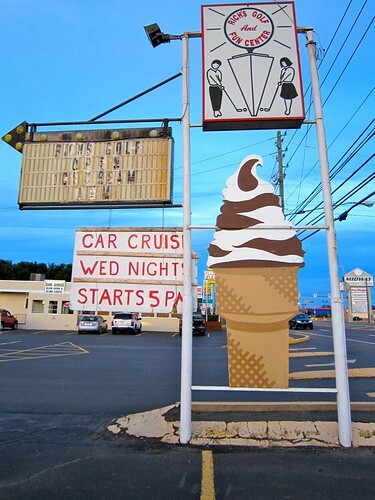 Tropical Treat in Hanover PA – You Can’t be a Crab at Crabbs! 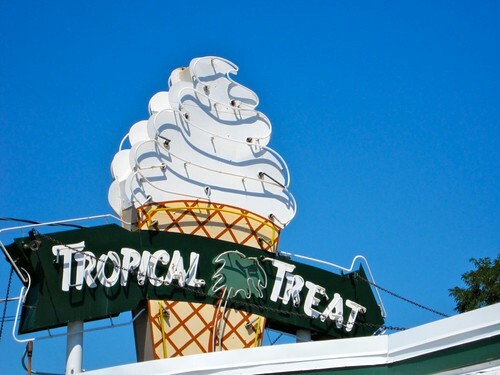 Crabbs Tropical Treat or “The Treat” has been a vintage roadside delight en route to or from downtown Hanover PA since 1953. 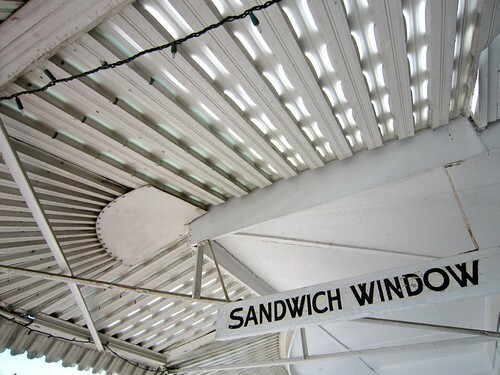 In a stretch of road that is more farm land than fancy, The Tropical Treat is an oasis of retro cool and tasty eats. And check out that vintage neon sign! You don’t see stuff like this often in PA so I say, “no crabbin allowed” when you head here! 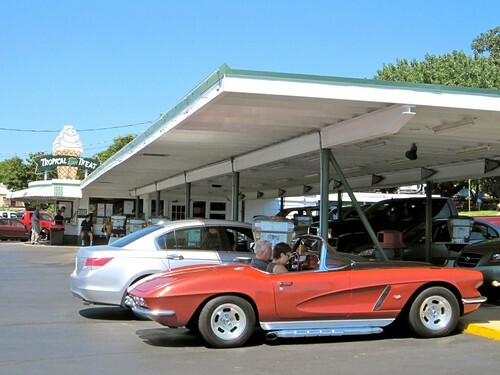 Not a cloud in the sky – what a great day for a retro road trip! The first time we saw The Treat we had to totally stop and gawk, and take photos even though they were closed. 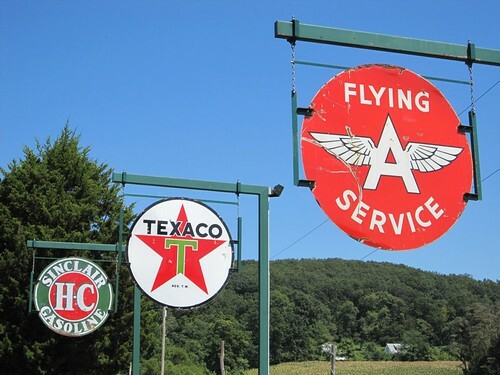 With the great vintage sign on top and the fact that they still had car hop service under the low slung canopy, it was definitely like discovering a place from the past. Even though The Tropical Treat is only open from mid-March to mid-October, it packs a lot of coolness into that time frame. I was able to visit on a sunny Saturday and was pleased to see practically every stall in the car hop area was full, with some cool cars too! Since The Treat has cruise nights, I bet there are vintage cars that must fill these parking spaces and overflow into the fenced in area. 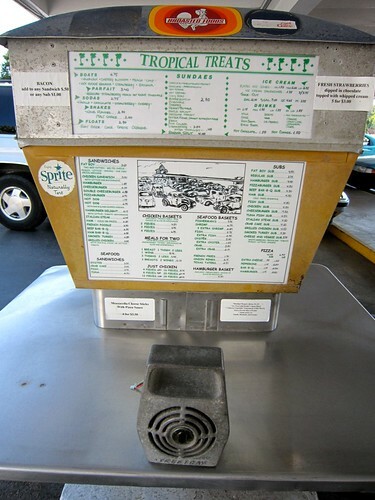 While walking towards the window I was able to catch a photo of the ordering system still in use for the car hop service. 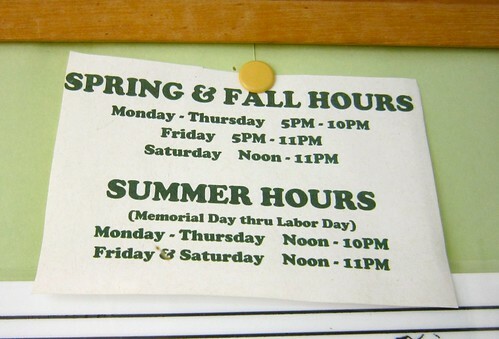 And took note of their hours while I waited for my number to be called. I took my food to go, but I could have easily asked to have it here, just letting the window person know what area of picnic tables I would be sitting at, and the Car Hop would walk out and bring my food to me.Next time I’ll do that for sure.This time I did decide to eat at one of the picnic tables out back under some nice shade trees, and much to my surprise, next to some fenced in chickens. 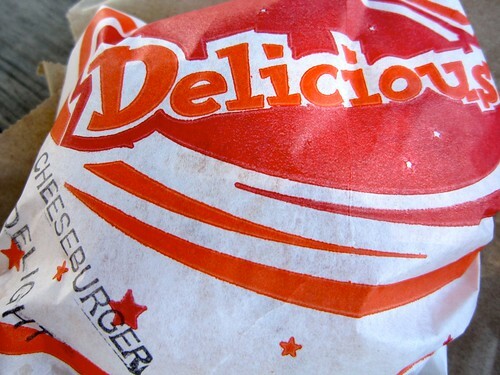 I would’ve felt bad if I got some Broasted chicken, but had no problem digging into my burger. It was indeed a tasty burger with lettuce mayo tomato and ketchup, and I pulled off enough of the exterior bun to share some with my feathered pals. Alas I didn’t have room for a cone shaped like that one on the cool sign, but if you go, let me know how it is! 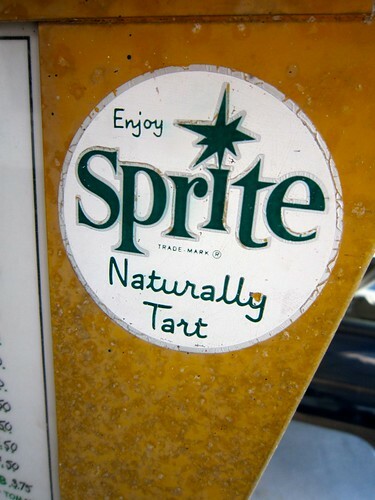 I’m getting a bit jazzed up for a retro roadtrip and am “wicked psyched” at how many fun vintage and retro inspired events happening- the latest is Surf Ohio FesTiki 2010 – held in Dayton OH on Saturday August 14. Aloha! Mark your calendar for Surf Ohio FesTiki 2010, the second annual celebration of classic surf, tiki and hot rod culture in Dayton, Ohio. Catch the big wave of family fun on Saturday, Aug. 14, at historic Old River Park — Dayton’s “vintage playground,” featuring a 1.5-mile scenic lagoon. Take an exotic trip back to America’s “Polynesian Pop” era of the 1950s and ’60s with six surf, rockabilly and Hawaiian music bands on the FesTiki stage! Thrill to the captivating rhythms of hula and fire dancers! Watch tiki carvers transform wooden logs into strange and frightening idols! Marvel at the gleaming chrome of classic pre-1970 hot rods! 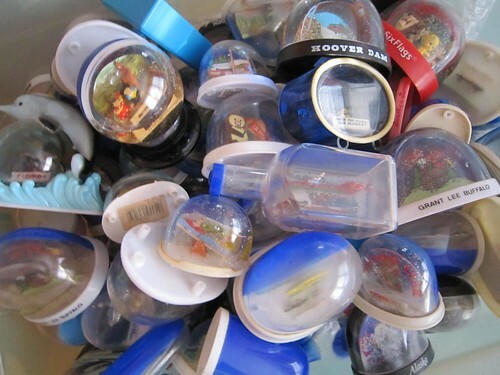 Gaze at the astonishing retro treasures in the vendors’ marketplace! Surf Ohio FesTiki is a production of Surf Ohio and the Fraternal Order of Moai. A portion of the proceeds benefit the Surfrider Foundation, a non-profit environmental organization dedicated to the protection and enhancement of the world’s waves and beaches. Click here to read more about Surf Ohio FesTiki 2 a surf-tastic Retro Inspired Event! Here’s where it is on the Retro Roadmap! I’m bumping this one up since it happens in just a few days – see you there! who used the name HOTROD HOEDOWN. There is ONLY ONE! The GRAND DADDY! EAST COAST STYLE ! SINCE 1999! THE HOTROD HOEDOWN AND ROCK-N-ROLL RUMBLE ! LIVE BANDS – ALL 3 DAYS ! Stop by for a day or make the weekend out of it, there’s places to stay, BBQ and you can BYOB. Look at this place on the Retro Roadmap!